When I was diagnosed, one of my first thoughts after ‘I’m going to die’ was that ‘I must do something positive with this experience.’ As someone who had been journal writing for eleven years, I decided that chronicling my experience then sharing it would be my way to help others. Empowering one’s self during adverse circumstances is the core message of Rebirth. Rebirth chronicles my battle with leukemia, beginning with diagnosis, continuing through chemotherapy and bone marrow transplant, and ending during the recovery period. Medical information about leukemia is included and medical terminology is defined in layman’s terms. However, it is the emotional and spiritual journey that is the major focus of my story. Through the years, my journals have not only been a place to capture events, but have also been effective tools for dealing with problems and finding solutions, and so during my year facing leukemia, I wrote in my journal almost daily. In it I faced fears, explored emotions, and articulated my hopes for the future. Many sources of inspiration, such as prayers, affirmations, and guided imagery were discovered, and when I found a particularly compelling quote, I’d record it and write my interpretation of it, which proved to be quite a therapeutic exercise. 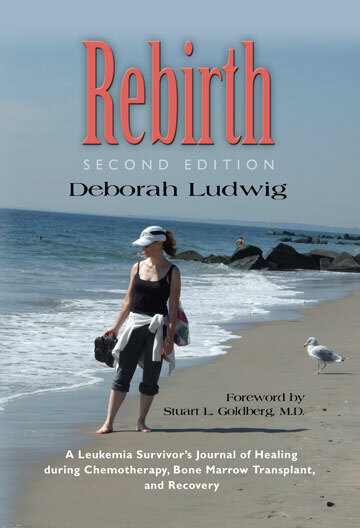 As physical and spiritual rebirth was happening, so was emotional rebirth. An archeological dig into my psyche enabled me to confront past hurts and resentments to which I had been clinging, thus allowing me to recognize how detrimental this clinging had been to my overall health. Life-altering experiences have a way of forcing self-reflection and re-evaluation, and complete healing involves the body, mind, and soul. This story also touches upon my sister Barbara’s journey. She was my bone marrow donor when she was pregnant with her second child and one of my primary caregivers. Pregnancy is thought to be an absolute contraindication to bone marrow donation, but the inclusion of Barbara’s courageous and poignant tale disproves this belief. Hers is an extraordinary story too, which is why I include it. My intentions for writing Rebirth are that people will discover how adversity can be an impetus and opportunity for personal growth, deeper appreciation for their relationships, living more fully in the present, and discovering an inner strength they never knew they possessed. No matter what the outcome may be, turning negatives into positives will always improve the quality of one’s life. Perhaps, dear reader, my journal will inspire you to write your own story, whatever that may be, because we all have stories to tell. I wish you health and happiness on your journey through life.